Executive Summary: Support for IE10 Enhanced Protected Mode on Windows 8 added; As a consequence Quero uses now a new Registry location to store its settings: "HKEY_CURRENT_USER\Software\Microsoft\Internet Explorer\InternetRegistry\Software\Quero Toolbar". Enhanced Protected Mode (EPM) is a new security concept introduced in Internet Explorer 10 on Windows 8 and adds additional sandbox mechanisms and restrictions to IE tabs and add-ons in order to make it even harder to exploit potential security vulnerabilities and mitigate their impact. The new Quero update now adds support for Enhanced Protected Mode and brings 64-bit support back in Desktop IE10. 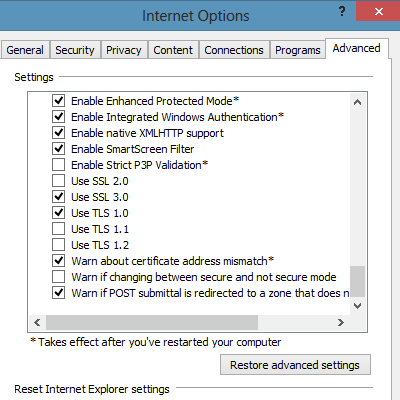 While EPM is enabled by default in the Modern UI/Metro version of IE10, the option is quite hidden in the Desktop edition of IE10 under Internet Options > Advanced > Security. Interestingly, the EPM option is also available in IE10 on Windows 7, but only enables 64-bit mode there and nothing more. Basically EPM does the following: it runs IE tabs and add-ons in 64-bit mode, sandboxes every tab including add-ons in an AppContainer and Low Integrity level process, enforces Network restrictions and substantially restricts read/write access to the System and Registry. A more detailed summary is available here: Understanding Enhanced Protected Mode by EricLaw. Option added to enable/disable the Quero context menu extension (Quero > Options > Advanced). Disabling the Quero context menu restores the Find Bar of IE10 and the "Save As web archive" option (unwanted side effects when registering a custom context menu in Internet Explorer). Please post feedback in the forum or on Facebook. Have fun with the new toolbar!